Last week I posted about the value of free content vs putting a gate that requires an email address and other personal information to get the content. Many people commented about my strategy of totally free content on my post Really, Truly, Actually Free Content and on social media. Today, I am sharing the results of one free content offer, an ebook that has generated millions of dollars in new business for the author. 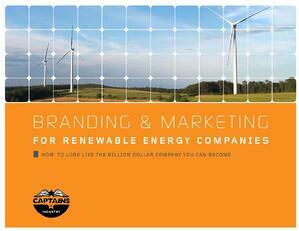 Ted Page, Co-Founder and Principal of Captains of Industry, a creative marketing consultancy based in Boston, wrote an ebook ten years ago titled Branding and marketing for renewable energy companies: How to look like the billion dollar company you can become. I spoke with Ted back then and encouraged him to make the ebook completely free with no registration. Ted’s ebook rose to the top of the search results for phrases related to the branding and marketing of renewable energy companies because it had a ton of valuable insights and depth and it was totally free with no strings attached. And, remarkably, the SEO has remained strong with the ebook remaining on the top of Google even a ten years after it was published. Ted tells me that this ebook consistently generates sales leads. People read it and then reach out to Captains. Just a few weeks ago the agency got an inquiry from a clean energy company that needs marketing services. Contrast Ted’s approach to the more widely accepted method of putting a gate on the content and then having salespeople call the “leads”. Next week I plan to post some specific advice for how you can create an ebook of your own.